Years after the theoretical physicist upended our understanding of black holes, scientists are close to photographing one for the first time. For a few nights in April last year, astronomers linked up eight radio telescopes in the United States, Chile, Spain, Mexico, and Antarctica for a little photo shoot. Their goal was to piece together an image of the supermassive black hole at the center of our Milky Way galaxy. Black holes, one of the most mystifying phenomena in the universe, are the epitome of camera-shy. The gravity of these extremely dense points in space is so strong that nothing, not even light, can escape. But with the right setup and powerful technology, humanity could catch a glimpse of one. Astronomers are still analyzing the data, and they hope to make their results public sometime this year. The final photograph, if they got it, would be the first-ever picture of a black hole. So far, scientists have detected black holes only indirectly. They have observed stars spinning violently around an empty void, and recorded the waves in the fabric of space-time from distant cosmic collisions. An image of a black hole would be the ultimate proof that these things actually exist. And the people behind this effort really wish Stephen Hawking were around to see it. Hawking, the English theoretical physicist, died Wednesday at his home in Cambridge, England, at the age of 76. He gave the world many important contributions to the study of the universe, but he is perhaps best known in the field for his work on the properties of black holes. His tremendous intellect, boundless curiosity, and best-selling books inspired a generation of astronomers and physicists who have devoted their careers to studying these invisible objects. After the news of Hawking’s death, I emailed several astrophysicists who study black holes about their reactions. For them, the thought that Hawking will not see the potential photographic evidence of a black hole is heart-wrenching. In the 1970s, Hawking upended theories for explaining black holes—but he didn’t actually mean to. “For a long time, people thought that black holes were these infinite sinks, like a roach motel—when things went in, they didn’t come back out again,” Doeleman said. Hawking believed much the same. So when the Israeli theoretical physicist Jacob Bekenstein, at the time a Princeton graduate student, suggested black holes have entropy—the disorder of a system, measured using thermodynamics—and therefore have temperatures, Hawking set about to prove Bekenstein wrong. He paired insights from small-scale physics (quantum mechanics) with those of large-scale physics (Einstein’s theory of gravity). After many hours of running through calculations, he concluded that Bekenstein was correct. Hawking determined that black holes actually spew out radiation particles, and even eventually shrink. These particles were named Hawking radiation. EHT won’t be able to photograph this radiation. “Hawking radiation is a teeny, tiny trickle of light compared to what needs to happen around a black hole to make it visible to astronomers,” said Sera Markoff, an astrophysicist at the University of Amsterdam, and another EHT member. Nor is the project capable of actually seeing the interior of the black hole. EHT is going after what’s known as the event horizon. This is the invisible boundary thought to surround every black hole, a point of no return beyond which light cannot escape. EHT uses high-frequency radio telescopes powerful enough to peer through walls of hot gas and take the sharpest images possible of this mysterious barrier. If the team got the shot they wanted last year, they will see the black hole in silhouette, illuminated by the glow of warped light as it gets sucked into the event horizon. 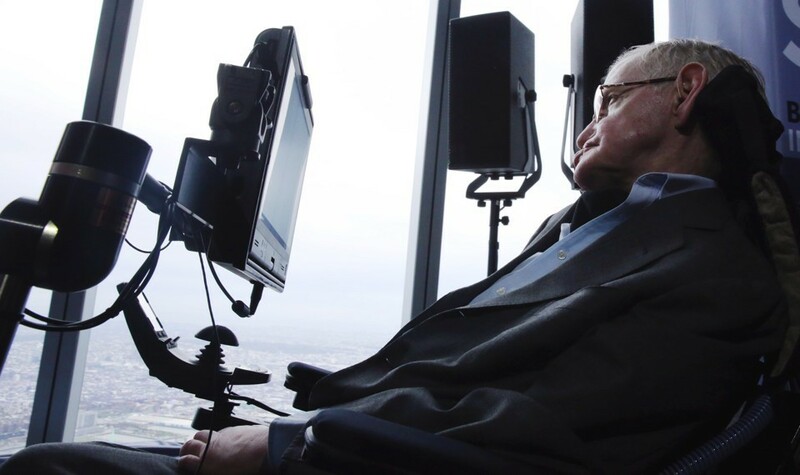 Hawking made his biggest contributions to the study of black holes a decade into living with amyotrophic lateral sclerosis, or ALS, a motor-neuron disease that eventually paralyzed and confined him to a wheelchair. “He persisted in his life and his work—wrote papers, gave talks—amusing talks, came to conferences, in the face of overwhelming difficulties,” said Charles Gammie, an astrophysicist at the University of Illinois. Hawking kept the debate about black holes lively, wagering bets with his contemporaries over who was right about one characteristic of black holes or another. Hawking was a giant in the field, but he was also a team player. Some black-hole researchers got into the field because of Hawking himself. Ciriaco Goddi, of the Leiden Observatory in the Netherlands, says he grew up in a small village in the mountains of Sardinia, where he didn’t encounter anyone that might spark an interest in science until he saw Hawking’s 1988 book, A Brief History of Time: From the Big Bang to Black Holes. He decided to study physics after finishing the book. Today, he’s a project scientist of the BlackHoleCam, the European effort working with EHT to produce the image Goddi hoped Hawking would see. “I want to imagine him now exploring the interior of a black hole at last,” Goddi said. In the statement announcing Hawking’s death, the physicist’s children wrote that he once said, “it would not be much of a universe if it wasn’t home to the people you love.” The universe is a lonelier place without Hawking, but he leaves behind a legion of scientists ready to unlock some more of black holes’ closely guarded secrets. The theory Hawking presented in 1974, for instance—that black holes emit radiation—still remains under some debate.